The photograph taken by Tom Andrews shows a huge wave hitting a platform in the North Sea. "There was a really bad storm at Bacton the gas terminal at Bacton we had a call from them to say that the weather conditions were very bad and they had had some walls blown down at Bacton brick walls blown down and we were to stay inside until the storm was over and we were working on the production side then because there is the production and the accommodation side and when we tried to go from the production accommodation there was a bridge and that was as much as we could do to walk well we couldn't we had to crawl across the bridge to get to the other side and when we were in the accommodation we had a telephone call from the stand by boat they had stand by boats in case of emergency and he said I don't know when I will see you but I am going with the storm the waves then were high, high enough to come and to hit the underside of the bottom deck they put sections of what they call wind wall up which were like three by three RSJs and that blew and took them completely off that was one of the worst experiences I 've had." I am compiling an archive of storm events on the Norfolk coast and would like to add this reference and picture to the archive (The picture is of course quite significant in that very few people ever get the opportunity to record such an event actually happening, although in the circumstance I'm not sure Mr. Thompson would think himself a particularly lucky man!). 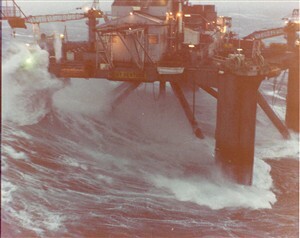 Do you have the date of the storm please and any further details ie What was the rig and was it evacuated?